Nothing suitable in promotional seed plant items? How about custom branded health items, logo printed corporate australian made products or one of our promotional eco friendly lifestyle items? Seed packets! Remind your client of your company for months after the seeds have been planted and grow herbs, flowers or trees! Ideal for green or sustainable promotions! Reduce your carbon footprint today and try one of our large ranges of environmentally friendly custom branded logo seed plant products. Promo seed items are a cost effective, cheap and useful environmentally friendly corporate gift that is environmentally friendly and does the right thing for the planet. Eco friendly and sustainable seed packets give a green brand image and are worthwhile using, as they are not only cost effective, but also contribute to absorbing CO2 from the environment, as the plants grow, and that way contributing to less greenhouse gas emissions in the atmosphere and a more beautiful and sustainable world. Our branded seed items include seeds such as FLOWERS: Sunflower, * Yarrow Red or White, * Ageratum, * Alyssum, * Amaranthus, * Ammi majus, * Antirrhinum, * Bellis, * Brachycombe, * Celosia, * Coleus, * Digitalis, * Heuchera, * Linaria, * Nemesia, * Papaver, * Penstemon, * Portulaca, * Sagina, * Saxifraga, * Sedum, * Veronica or HERBS: * Parsley, * Basil,* Anise hyssop, * Calamint, * Bergamot, * Chamomile, * Feverfew, * Marjoram, * Oregano, * Stevia, * Tansy, * Tarragon, * Valerian, * Wormwood, * Yarrow, * Lemon Balm, * Chives, * Mint, * Catmint, * Thymus or NATIVES and Sundry plants: * Agonis, * Any Callistemon, * Any Leptospermum, * Any Melaleuca, * Any Kunzea, * Lophostemon Confertus, * Viola, * Poor Mans Orchid, * Petunia, * Livingstone Daisy, * Lobelia, * Busy lizzy, * Babys Breath, * Monkey Flower, * Clarkia, * Bottlebrush, * Kangaroo paw, * Lemon Scented Bottlebrush, * Scented Paperbark, * Weeping Red Bottlebrush, * Poppy, * Forget Me Not, * Pansy, * Kanuka, * Manuka, * NZ Xmas Trew or VEGETABLES and FRUIT: * Alpine, * Strawberry, * Carrot, * Tomato, * Broccoli, * Radicchio, * Cabbage, * Lettuce, * Chinese cabbage, * Cauliflower. We have available custom printed give away seed packs, custom printed promotional seed booklets, custom printed logo seed postcards, marketing mailout seed bookmarks, custom printed promotional seed bottle neck hangers, custom printed promotional seed mailer door hangers and even mini custom printed eco-friendly seed pot plants. 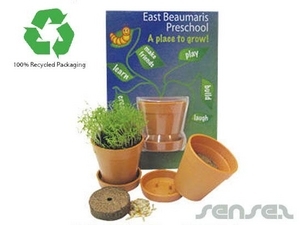 Our Eco friendly promo seed products are environmentally friendly with recyclable packaging. Environmentally friendly branded seed plant products are a great way to endorse an environmental message and to create constant brand awareness and brand exposure for your business. Custom printed promo seed filled sachets come with a huge choice of plants: lots of natives, flowers, fruits, herbs etc. Branded corporate seed plant products are great items for any environmental or Australian related event. Promotional seed plant products make ideal direct mail, mail outs and magazine inserts giveaway. Custom printed logo seed booklets look similar to match stick boxes with tear off sticks ready to plant in soil and watch grow. Custom printed promotional seed bottle neck hangers are a perfect edition to a bottle of wine, champagne or any other beverage, especially if it has been organically made and you would like to stress that selling point. Custom printed promotional plant seed door hangers will make sure your advertisement or door drop off campaign is definitely kept and noticed. Custom printed logo seed door hangers are also great for real estate agents or door to door advertising campaigns. Eco friendly marketing seed plant products are a great way to promote your business, while adding an environmental spin. Custom printed promotional seed bookmarks are functional and are used as a bookmark with the additional value of a plant seed pack. Custom printed promotional seed bookmarks are great for environmental promotions at gardening centres and gardening book stores. Custom printed promotional plant seed postcards are great environmentally friendly mail outs that will evoke good will. 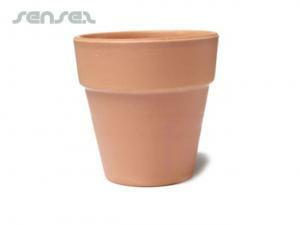 For a cute, novel and innovative gift give away, try our mini custom printed promotional seed pot plants. Grow your own herb, flower, native plant or fruit or vegetable with our mini pot plant with custom logo print on recycled cardboard insert. They are packaged in recycled plastic pots and come with compact soil and sunflower seeds. We can do other seeds also (as long as they are native Australian plants). These promotional pot plants are great for the office desk and workplace, to add a little bit of nature back into our overly technological environment. Promotional seed plant products are cost effective and make the ideal corporate gift give away that is also an effective marketing tool with a great functional purpose and environmental message. Available seeds include: FLOWERS: Sunflower, * Yarrow Red or White, * Ageratum, * Alyssum, * Amaranthus, * Ammi majus, * Antirrhinum, * Bellis, * Brachycombe, * Celosia, * Coleus, * Digitalis, * Heuchera, * Linaria, * Nemesia, * Papaver, * Penstemon, * Portulaca, * Sagina, * Saxifraga, * Sedum, * Veronica or HERBS: * Parsley, * Basil,* Anise hyssop, * Calamint, * Bergamot, * Chamomile, * Feverfew, * Marjoram, * Oregano, * Stevia, * Tansy, * Tarragon, * Valerian, * Wormwood, * Yarrow, * Lemon Balm, * Chives, * Mint, * Catmint, * Thymus or NATIVES and Sundry plants: * Agonis, * Any Callistemon, * Any Leptospermum, * Any Melaleuca, * Any Kunzea, * Lophostemon Confertus, * Viola, * Poor Mans Orchid, * Petunia, * Livingstone Daisy, * Lobelia, * Busy lizzy, * Babys Breath, * Monkey Flower, * Clarkia, * Bottlebrush, * Kangaroo paw, * Lemon Scented Bottlebrush, * Scented Paperbark, * Weeping Red Bottlebrush, * Poppy, * Forget Me Not, * Pansy, * Kanuka, * Manuka, * NZ Xmas Trew or VEGETABLES and FRUIT: * Alpine, * Strawberry, * Carrot, * Tomato, * Broccoli, * Radicchio, * Cabbage, * Lettuce, * Chinese cabbage, * Cauliflower.